AutoSlash - We automatically slash your rental rates! Sometimes it's impossible to find a great deal on an airport rental car. For starters, airport rates tend to be higher than off-airport rates, and then you pile on airport surcharges and taxes. When airport car rental rates are sky high, expand your options. Research rates on one-way rentals and also non-airport locations. It often turns out that, even after an Uber ride from the airport to an off-airport rental car location, the savings will be significant. We recently looked for a one-way three-day rental car with a pickup at Long Beach Airport and a dropoff at San Diego International Airport. The cheapest rate we could find was with Hertz—a ridiculously expensive $281.45 under the USAA rate code. That works out to almost $100 per day for an intermediate car, which is outrageous. We didn't want to use Hertz Gold Plus Rewards points on this trip, as one-way rentals require far more points. It made sense to search for a better deal at an off-airport location. When you fly into a destination and then rent from an off-airport rental car agency, you need to factor in the cost of getting to the pickup location. For example, when renting off-airport in Boston, we like the Atlantic Avenue locations because there's a free bus from Boston-Logan International Airport. To be able to compare prices, you need to add the cost of transportation to the pickup location and the cost of the rental rate. You will also need a plan if your flight is delayed and you arrive too late to pick up off-airport. That means finding a location with long hours that is convenient to the airport. For our trip from the Long Beach airport, we zeroed in on the Hertz location in Signal Hill, since it is literally just outside of the airport grounds. Even with a tip, this is still a reasonable Uber fare. Our research showed that, while the rate at the Signal Hill location wasn't the absolute least expensive, it was the cheapest when factoring in the cost of getting there from the airport. While the Hertz location at the airport was asking $281.45 for the three-day rental under the USAA rate, the Hertz in Signal Hill on the airport perimeter was asking $124.53—which worked out to less than half price even after paying for the ride there. 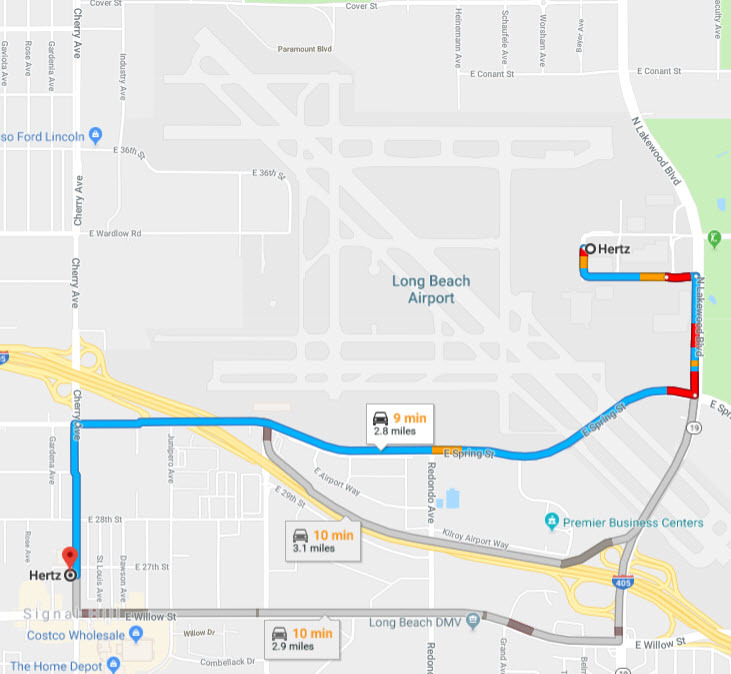 What's more, the Hertz at Long Beach Airport doesn't have a Gold Choice Aisle, so the Signal Hill neighborhood location offered exactly the same choice of vehicles. We would have been assigned Ford Fusion hybrid regardless of which location we chose. The lesson here is that you can often beat a pricey airport car rental rate with a little research and some flexibility. Find an off-airport location that's cheap and easy to get to, and give yourself a pat on the back for saving serious money with just a little extra hassle. Ready to save on your next rental car? Click below to request quotes and we'll round up the best possible rates within minutes. Subscribe to our feed – or – Get our newsletter via email! Sorry, there was a problem subscribing you to our newsletter. Please try to subscribe again later. AutoSlash will never disclose your email address to any third parties. You will be able to easily unsubscribe from our mailings at any time.